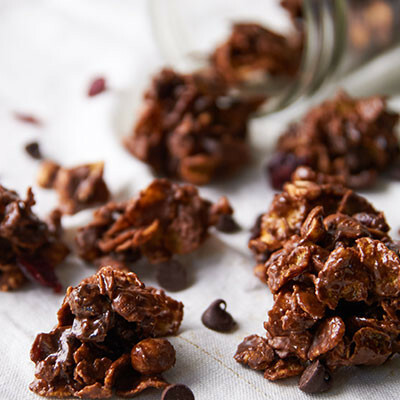 This easy to make recipe is an amazing afternoon treat or fun, on-the-go snack. Place chocolate chips, peanut butter and butter in microwave-safe bowl. Heat on HIGH 30 seconds. Stir until butter is melted and mixture is smooth. Stir in CARNATION BREAKFAST ESSENTIALS® Powder. Combine cereal, peanuts and cranberries in large bowl. Pour chocolate mixture over cereal. Toss to coat in chocolate mixture. Use a tablespoon to scoop mix onto prepared baking sheet. Place in refrigerator 30 minutes or until cool and hardened. Store in cool, dry place.